The website for The ’68, the 151-unit apartment project that developer David Adelman is building at Hemisfair, is now live, which means you can sign up for a January hardhat tour. When The ’68 opens in the spring, the $25.5 million project will overlook Yanaguana Garden, making it one of the most desirable places to live downtown. Do you make enough money to live there? Actually, there’s a good chance you do. A combination of local and state rules, which make the project possible, require Adelman to offer some rents to households making as low as 50 percent of the area median wage. And they’re all up for grabs on a first come, first serve basis. Fifteen units of the 151 total will be considered affordable based on a consensus reached by the City Council during discussions at meetings the past two weeks. In those talks, most on the Council seem to agreed that apartments offered to households making 60 percent of the area median income (AMI)—which is $40,800 for a family of four, according to the U.S. Department of Housing and Urban Development—are truly affordable in San Antonio. Here’s how it works at The ’68. Adelman, through his company AREA Real Estate, has partnered with a public entity called the Hemisfair Park Public Facility Corp. (PFC). Because the PFC owns the land, Adelman’s development is exempt from paying all property taxes as long as he provides half of the units to people making 80 percent AMI (which many on the Council, including Mayor Ron Nirenberg, do not consider as affordable for the average San Antonian, thus the new 60 percent threshold). The other half of the units can be rented at market rate prices. But Hemisfair has its own rules in place. Ten percent of the units (that is, 15 of The ’68’s 151) must be rented to people making between 50 and 70 percent AMI. On top of that, their rent cannot exceed 25 percent of their income—a restriction that adds more affordability than other PFC projects, such as the one being planned for the corner of Broadway and Jones Avenue by NRP Group (in partnership with the San Antonio Housing Trust PFC) where it can charge up to 35 percent of a household’s income. All of that is well and good, but here’s the other thing you have to be aware of. Adelman, if he chooses, can make all of The ’68 apartments market-rate. However, he would lose the full tax exemption offered under the PFC agreement. And he would still be bound by Hemisfair’s rules. “He’s welcome to do that, but he would still need to meet our workforce housing policy,” Hemisfair CEO Andres Andujar said. 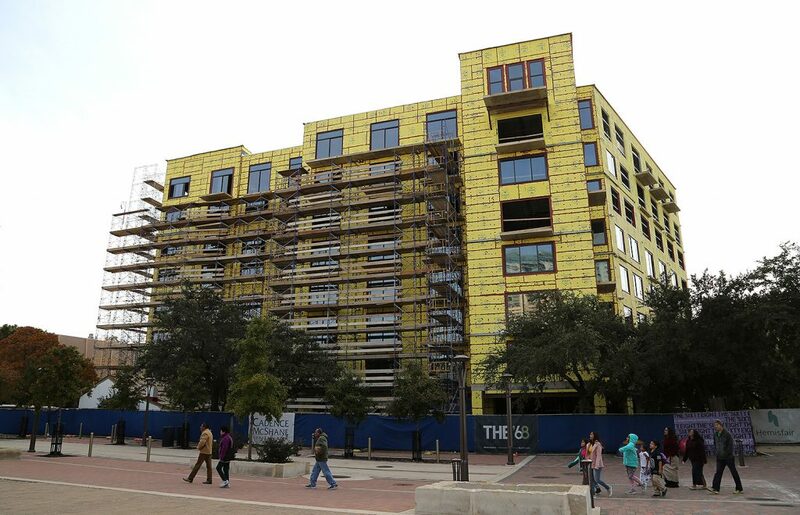 Under the Hemisfair rules, if Adelman chose to convert the entire project into market-rate housing, the 10 percent affordable requirement would expand from the current 50-70 percent AMI range requirement to a 50-110 percent AMI requirement. Andujar said 120 percent AMI is widely considered as market-rate, so renting to a household that makes slightly above the AMI—which is $66,800 for a family of four—would still be considered below market-rate. Adelman said the tax exemption provided by the PFC makes the project viable from a return on investment standpoint. Take that away, he said, and “it probably doesn’t pencil,” meaning Adelman would make less money. Under the arrangement with Hemisfair, AREA Real Estate is leasing the property for 45 years with three 10-year extensions, Andujar said. In addition to the 151 units, The ’68 will add 4,169 square feet of retail space to Hemisfair, which has become a mini culinary destination—and growing. Aside from the full tax exemption, The ’68 is also receiving a Center City Housing Incentives Policy package worth $541,989—$469,895 in SAWS impact fee waivers, and $72,094 in city fee waivers. Editor’s note: The Mayor’s Housing Policy Task Force, in its report titled “San Antonio’s Housing Policy Framework: The Cornerstone of Economic Development,” uses the 2016 U.S. Census American Community Survey 1-year AMI of $49,268, because it says it better represents the average San Antonio wage. The HUD AMI of $66,800 comprises the greater San Antonio area, which includes New Braunfels and everything in between.